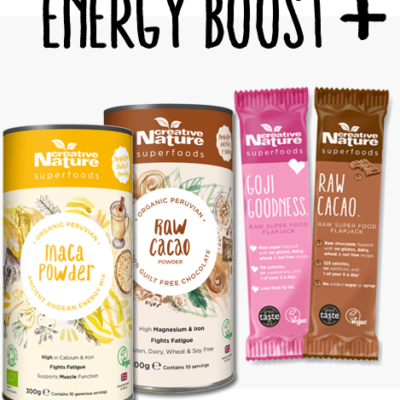 We’ve taken our best-know energy boosting products and combined them into one easy Creative Nature Energy Booster bundle for you, with snacks to stay energised on the go and superfoods to add to smoothies at home. Organic Maca Powder 150g – Packed with minerals that help fight tiredness and fatigue, this super powder has earned the nickname ‘Spanish Viagra’! Organic Cacao Powder 100g – Mix this into your smoothie with the Maca Powder for an extra antioxidant boost. 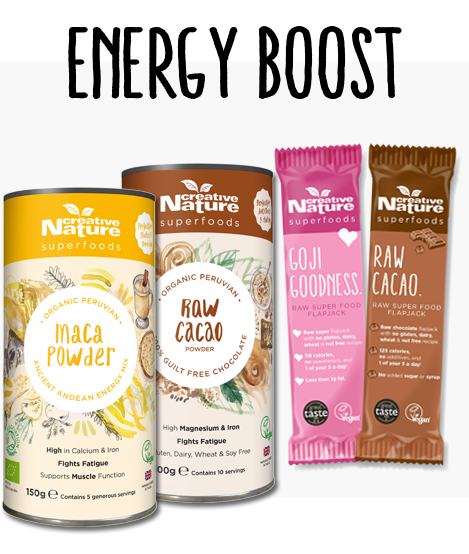 It’s great for keeping the body in top energetic shape and also adds a delicious Chocolatey taste! 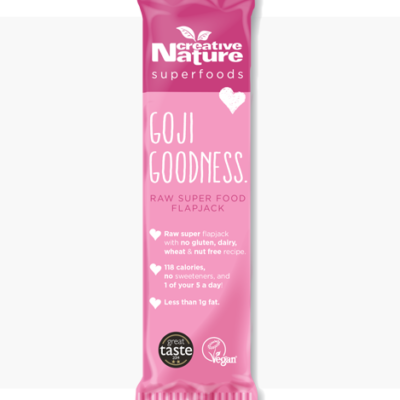 Goji Goodness Superfood bar x 5 – The UK’s greatest tasting cold-pressed Superfood bar is also a great source of energy! Full of natural fruit sugars which will provide you some quick-release carbohydrates to get you going throughout the day! Raw Cacao Superfood bar x 5 – A Great Taste Gold Star winning snack bar with cacao powder and nibs to boost antioxidants. A great bar to have before a workout or as a treat after some cardio to replenish those glycogen stores. 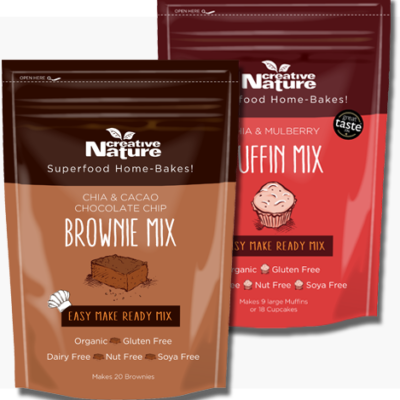 All of the products in this bundle are free from gluten, dairy, wheat, soya, refined sugar, sweeteners and peanuts.